The Victorian government has grand plans to “lead the charge against climate change” in Australia, and the case for decisive action could not be stronger. The Bureau of Meteorology’s Annual Climate Statement confirmed Australia experienced its third hottest year on record in 2018. Victoria was hit with its highest mean maximum temperature on record, at 1.44 degrees above average. This angry summer of heatwaves, drought and bushfires is being driven by human-induced climate change. Fortunately, Victoria is beginning to walk the walk on its climate leadership talk. It has introduced strong climate legislation in the form of the Climate Change Act, committing the state to achieve net zero emissions by 2050. The Victorian government has already taken a number of tangible steps towards tackling climate change. Victoria’s Renewable Energy Target is supporting the rollout of new wind and solar projects across the state. The establishment of the LaTrobe Valley Authority is helping coal communities transition away from fossil fuel. The state is also making major investments in public transport such as the Metro Tunnel project, and Melbourne’s solar-powered trams. Melbourne’s water authorities are working on deep and rapid cuts to greenhouse gas pollution to reach their target of net zero emission by 2030. In the coming months, Victoria will face a further test of its public commitment to leading on climate change. After considering advice from its independent expert panel, the state government will set interim emissions reduction targets for 2025 and 2030. These targets are intended to put the state on a path to net zero emissions. Strong interim emissions reduction targets would provide clear evidence of the state’s climate clout. The question is, what will Victoria choose to do? By setting in stone strong climate targets to rapidly drive down Victoria’s greenhouse gas pollution across all sectors of the economy – electricity, transport, agriculture and industry – the state would bolster its position as a national climate leader, as well as helping to drive investment and jobs in clean technologies. The experience of states like California – the world’s fifth largest economy – shows strong climate targets and strong economic growth can go hand in hand. California is already on track for 50 per cent renewable energy by 2020. Last year the aptly named Golden State set targets for 100 per cent clean power and net zero emissions economy-wide by 2045. This is the perfect opportunity for Victorians to show the federal government what strong climate policy looks like. The federal government’s greenhouse gas pollution target of 26-28 per cent below 2005 levels is woefully inadequate in terms of the science, and Australia contributing its fair share. Even worse, Australian emissions have continued to rise for four years in a row, in the absence of credible climate policy from the federal government. A strong interim target for Victoria could transform the national debate on climate change. Victoria is facing a climate crossroad. 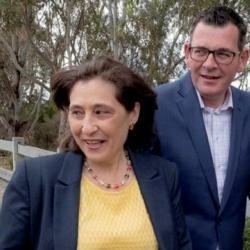 Victorian Climate Change Minister Lily D’Ambrosio has described the state’s renewable energy and climate policies as “nation-leading”. Strong emissions reduction targets for 2025 and 2030 would stand as a testament to the state’s climate leadership. And what better opportunity for the state government to substantiate Premier Daniel Andrews’ claim that Victoria is “the most progressive state in the nation”?